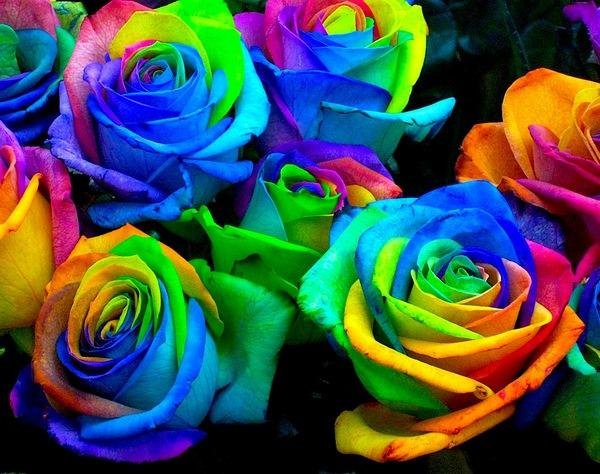 How incredibly fantastic are these...rainbow roses?!?! A guy by the name of Peter Van de Werken (who owns a floral shop in Holland) came up with this genius idea. I was looking to see how in the world you can do such a thing...its almost like a box of crayons had babies with a bed of roses--and then as I read and read they seem pretty easy to do. You simply take your roses and cut the bottom of the stems into different channels or pieces (I would do maybe three or four sections) and then put each cut piece in a different color of water. 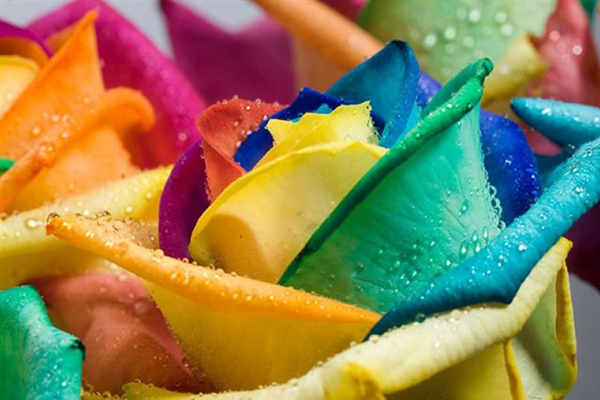 They will do what all roses do, and drink it up, and then the colors will illuminate into the petals!!! I am going to HAVE to try this--but if any of you beat me to the punch let me know how it goes! Omg thats awesome! Such a good idea, I definately want to try it! I think I may have to try this. How pretty!! Someone buy me some roses so I can try this!!! Amazing.......I used to do this with carnations...but roses are much more stunning! I bet if all the high schoolers found out about this, it would be the new prom trend! we sell these at our flower shop in southern Indiana and Girls ARE ordering these for their proms :) we love them! This was in a scholastic handout my daughter brought home on Friday. We are going to make some this week. She has been begging and it was the best idea they ever sent home. How funny! So cool - just pinned it! Oh my goodness. I MUST try this. Thank you for posting!! Oh my goodness, I can't believe these are real! So cool! I don't understand how it can be different colors. I understand you cut the stem in different places, but how do you separate the colors for one flower? I would love to do this. I guess if I had read further, I would not need to ask the question. Thanks! I can't wait to try this! haha thats okay anonymous...if you have any other questions let me know! I actually tried this a few weeks ago! It was not nearly this bright, but still turned out really neat! I did it for my sister in law who loves all things tie dye, and she FLIPPED! It was a ton of fun! I did 4 different sections of the stem and put them into little plastic tubes I had. Within about 24 hours the rose had absorbed the colors. Next time I think I'll saturate the water with more color though, I think it would've been a little brighter that way. My mom showed me how to do this with a Peony when I was a kid. I have been doing this ever since. What color water works the best? we sell these at our flower shop in southern indiana... they are a HUGE hit! check us out on facebook little crazy daisy! do you start with white roses? I think it would be best to start with white! That way the colors show up even brighter!